Hallprint's range of T-bar anchor tags are without doubt the most popular tag types produced by Hallprint. They represent a generational improvement in fish tag design with a single moulded construction that has a protective outer sheath around the coloured and individually numbered marker. T-bar tags are popular on fish, crustacean and even some shellfish species where large numbers of fish may need to be tagged in a short space of time and/or holding time is critical for fish survival. T-bar anchor tags are available in a wide range of colours in both fine anchor (TBF) and standard anchor (TBA) versions. TBA tags may have either one or two lines of print (TBF one line only). Please note that both exposed filament length and marker length can easily be varied on all T-Bar tag types to suit your custom requirements (see below). We are also able to custom print in numerous languages (subject to font provision for no additional charge. Average marker length is around 20 mm for TBF tags and 30 mm for TBA tags but can vary from around 12 mm to around 40 mm for TBF tags and from around 12 mm to 60 mm for TBA tags. The length of exposed filament is normally around 15 mm for TBF tags and 20 mm for TBA tags. Exposed filament lengths of between 10 mm and 40 mm are possible for both tag types. Please ensure that both the exposed filament length and the marker length preferred are provided when requesting quotations or ordering tags. Stainless steel head dart tags (type SSD) are for marking large fish such as billfish and especially sharks which can not be easily brought aboard. The tag head is specially ground and sharpened to anchor smoothly in firm tissue or muscle. All metal used in the dart head and wire is 316S marine grade surgical steel. SSD tags are made with the stainless steel wire covering the inside of the first 5 cm of the marker. Some researchers prefer to have a stainless steel wire core along the length of the tag if there is a high likelihood of the tags being bitten by other sharks or predatory fish. These tags have superior legibility and integrity to our competitor’s products. Like the SSD tags the plastic head intra-muscular tags - type PIMS (small) and PIMA (large) - are also used for tagging large gamefish that cannot easily be brought on board. The tag head was developed by the Billfish Foundation (US) and the US National Marine Fisheries Service and has become the favoured tag head for billfish in most parts of the world. These tags are not suitable for tagging sharks due to the toughness of the skin. There is some evidence that the softer, rounder nylon head promotes tissue healing faster than in the stainless steel head version resulting in an apparent increase in tag retention over SSD tags in some species of billfish. There is also some published evidence (in tuna) of higher mortality with this tag type compared with standard plastic tipped dart tags so the right tag for your needs will be determined by a number of factors including your study objectives as well as cost considerations. Hallprint's PIMS and PIMA tags will not suffer problems associated with legibility or detachment of the marker that have been reported from similar tags made using these heads by other manufacturers. This is because our markers are moulded to the stainless wire to produce an integrated unit without the need for glue or print-obstructing mono doubles to keep the marker on. We consider that print legibility and retention on our tags is also far superior to our competition - view this for yourself by asking for some free samples. Self locking tags are less popular for high volume tagging operations in which the primary objectives may be relatively short term movement patterns. IEX tags provided an excellent internal anchor in the abdomen while requiring only a needle prick in the body cavity wall to accommodate the tag. Stainless steel head dart tags (SSD) are for marking large fish such as billfish and sharks which can not be easily brought aboard. The tag head is specially ground and sharpened to anchor smoothly in firm tissue or muscle. All metal used in the dart head and wire is 316S grade surgical steel. SSD tags are made with the stainless steel wire covering the inside of the first 7cm of the marker. Some researchers prefer to have a stainless steel wire core along the length of the tag if there is a high likelihood of the tags being bitten by other sharks or predatory fish. These tags have superior legibility and integrity to our competitor’s products. The 8 x 4 mm oval tag is by far the most popular as it generally conforms well with the grooves on the shell surface. The 8 x 4 mm oval and 8 mm diameter circle tags can be produced with up to four alpha-numeric characters (eg A000 - A999) whereas the 16 x 8 mm tags can utilise up to seven characters per tag (e.g. A000001 - A001000). Tags are presented on strip rolls for easy detachment in ascending sequential number order. As with most of our tags the full colour range is available. Hallprint's polyethylene streamer tags are extremely popular with researchers for a wide variety of finfish and crustaceans including especially prawns (shrimp), juvenile fish and clawed lobster. A range of sizes are available with a variety of notch styles and sizes. 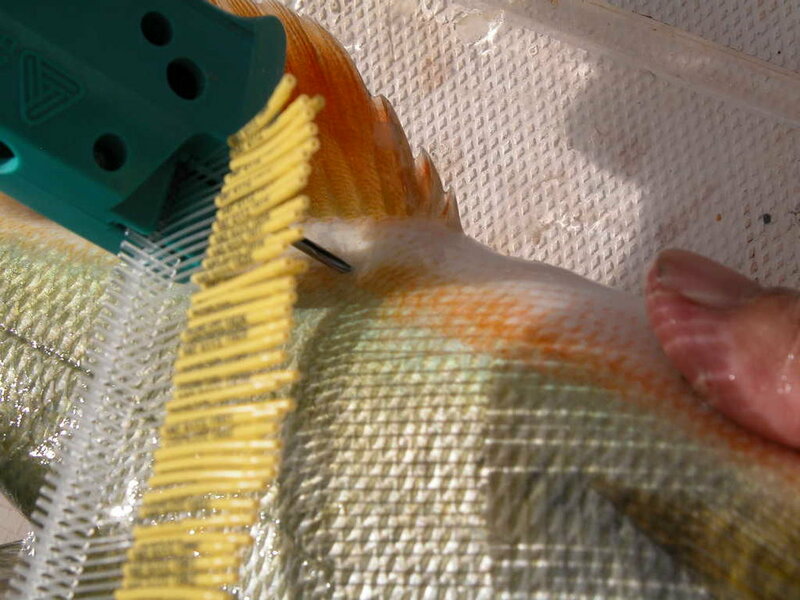 Hallprint pioneered a streamlined attachment of the disposable applicator needle to the tag to minimise the tag entry wound which is critical for tag retention and survival of delicate young fish and prawns. The standard needle length is now 58 mm (see on 2XW tag below) although the previous standard size of 38 mm (see on 2W tag below) is still available on request. Both needles are exactly the same gauge or diameter but most find the longer needles easier to use. Up to a maximum of seven alphanumberic characters may be used including sequential tag numbers. Our streamer tags may be packaged in "snap lock" plastic bags in lots of 25 or 50 or for an extra fee they can be placed on folded cards ready for easy field application in sequential tag number order. Please note that we are now only able to print numbers on one "wing" of the PST tags as per the 13S tag below and can not print on both "wings" as per the 2W tag below. Hallprint's range of plastic tipped dart tags (see below) are designed to provide a diversity of high quality options for researchers embarking on a finfish tagging program. Please note that all dart tags can be custom produced to the length required for each study and need not be made to the lengths shown. In elasmobranchs the barb is lodged in a cartilagenous section of the fish, usually in the body of the fish below the dorsal fin in sharks or in the "wings" of rays and skates. The smallest dart tags, the type PDX and PDXL (see below), have a ~ 1.2 mm diameter marker and are applied with an approx. 2.4 mm outside diameter applicator needle. They are suited to finfish species between about 20 cm and 30 cm (PDX) or 28-40 cm (PDXL). These tags are popular for small fish likely to undergo fast growth rates such as juvenile tuna. A tag ID number can only be produced at the distal end of the marker and only one line of print is possible on these particular tags. The small dart tag range (type PDS, PDL and PDW - see below) have a ~1.6 mm diameter marker and are applied with an ~3.3 mm outside diameter applicator needle. This range is suited to fish across a wide range of sizes, with the PDS and PDW tag suitable for fish from about 35 cm up to about 55 cm and the "dogleg barb" PDL tag (see bottom of page) which is suited for fish from about 40 cm up to about 80 cm. These tags are very popular with recreational fish tagging programs for a wide variety of species due to the ease of use and lower unit cost of applicators compared to T-bar tags. An ID number is usually printed at both ends of the marker and two lines of text are possible although only one is recommended in order to maximise the font size and hence readability of the print. Large dart tags (type PDA - see below) have a ~1.6 mm diameter marker and are applied with a ~4.0 mm outside diameter needle and are proven performers with finfish and sharks from about 45 cm and above including tuna, barramundi, snoek, tarpon and spanish (king) mackerel to name a few. A thicker and more visible version of the type PDA tag called the PDAT (see below) is often produced with a ~2.0 mm marker (see below). This uses the same diameter needle as the type PDA tag and has an identical tag head. The PDAT tag is only available in high visibility yellow or orange colours.